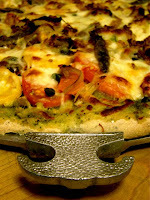 Here's a use for the 15" round tray that its makers never imagined: pizza. 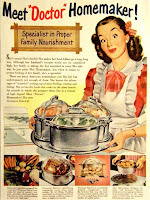 The Guardian Service Round Tray was originally designed to carry all three Economy Trio Cookers (it cradles them nicely and might work well as a trivet on a large table or buffet, but to actually carry all three roasters, piping hot and loaded with food, is not as finger-tips breezy as "Doctor Homemaker," pictured below, would lead you to believe. In the 1935 edition of Guardian Service Tested Recipes, Betty Gay suggests that "your GUARDIAN Round Tray makes an attractive cake plate. With a lacy paper doily on it, it's quite the thing." But here's an idea to really put this tray to work: pizza—the American Classic that America hadn't yet invented back in the day that these trays were being minted by the good folks at 6000 S. Avalon Blvd in Los Angeles, CA. Some of the finest New York Pizza is cooked on big aluminum rounds and this service tray does the job nicely. We've baked up dozens of varieties: Pepperoni/Anchovy, Margherita, "Hawaiian" (Canadian Bacon/Pineapple), Barbecued Chicken, Pulled Pork, Pear/Walnut/ Gorgonzola.... And here's New Depression cooking for you: for less than ten dollars worth of ingredients, you can cook up a 5-star Gourmet Pizza that will make you wonder why you ever eat out. A crispy, chewy, tender crust. This easy recipes yields enough dough to create a medium-thick crust on the 15" Guardian Service Tray. Stir yeast into warm water in small bowl and let stand about 5 minutes, until yeast dissolves. Lightly brush a large mixing bowl with olive oil and add the flour, sugar, salt, making a well at the center. Add yeast mixture and olive oil and stir to combine, adding more flour if very sticky, more warm water if too dry. Kneed dough for 10-15 minutes and work into a ball. Drizzle dough with olive oil, cover with a cloth and let rise in a warm area, free of drafts, until doubled in volume, about 1 hour. Punch dough down and roll into a disc. 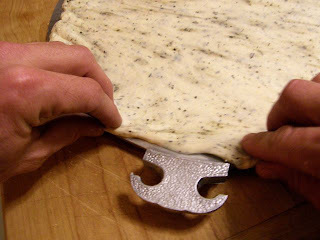 (I've never developed a pizza dough spinner's knack—I stretch it by hand, or roll out the dough between two Silpat mats with a roller pin, then lay it out on the tray). Position dough on the tray, tacking the outer edge of the crust to the rim of the tray. Bake at 450° for 20 minutes or until cheese is bubbling-golden-brown. Let rest for a few minutes, then remove pizza to cutting board (or cut directly on the tray with a silicone pizza slicer, which won't scratch the surface) and serve. 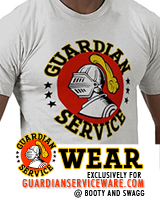 As with all Guardian Service cookware, the aluminum evenly distributes heat, so the crust crisps perfectly (the airpockets created by the hammer-finish help too). *Note: If you're planning to really load on the toppings, pre-cook the crust for 5-15 minutes before adding sauce and toppings. Holy crap that's brilliant. I just bought a 23 piece set from a moving sale for $85...I haven't tried it out yet, but can't wait! I was thinking of using the roaster to do a turkey on the BBQ...any tips? Is that a crazy idea? 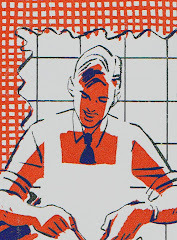 Also...do you know of a site where I can download the original instruction/recipe book? There are two roasters in the cookware line: one for roasts and chicken and a larger one for turkeys, geese, etc. To be honest, I've not yet cooked a turkey in the GS ware but am planning to do so this fall/winter (check back!). I know, I about drooled all over the poor old man selling it...had a bit of guilt, I did let him know how precious it is and that I would take great care of it...saw him yesterday actually and thanked him again, he said it had been in his family since he was 10, remembers the day his parents went to the party, dad saying they were just going to be polite and ended up coming home with the full set....I would estimate that to be al least 50 if not 60 years ago.